With disappearing music venues, and arts and culture communities at constant risk of displacement in our urban centers, the preservation of intangible cultural heritage is of growing concern to global cities. This book addresses the role and protection of intangible cultural heritage in the urban context. Using the methodology of Urban Legal Anthropology, the author provides an ethnographic account of the civic effort of Toronto to become a Music City from 2014-18 in the context of redevelopment and gentrification pressures. Through this, the book elucidates the problems cities like Toronto have in equitably protecting intangible cultural heritage and what can be done to address this. 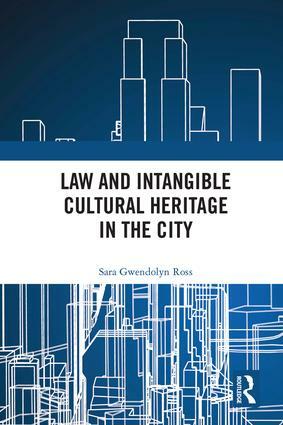 It also evaluates the engagement that Toronto and other cities have had with international legal frameworks intended to protect intangible cultural heritage, as well as potential counterhegemonic uses of hegemonic legal tools. Understanding urban intangible cultural heritage and the communities of people who produce it, is of importance to a range of actors: from urban developers looking to formulate livable and sustainable neighbourhoods, to city leaders looking for ways in which their city can flourish, to scholars and individuals concerned with equitability and the right to the city. This book is the beginning of a conservation about what is important for us to protect in the city for future generations beyond built structures, and the role of intangible cultural heritage in the creation of full and happy lives. CHAPTER THREE: TORONTO - MUSIC CITY? II. WHAT IS A "MUSIC CITY" AND HOW DOES A CITY LIKE TORONTO BECOME ONE? IV. POST-GUVERNMENT AND THE ONGOING POST-INDUSTRIAL SHIFT: WHERE DO THE DISPLACED GO? III. FURTHER BARRIERS TO ATTAINING A LICENSE FOR A "NIGHTCLUB" OR "ENTERTAINMENT FACILITY"